Posted on July 5, 2015 by Sarah S.
I only have a few days left on my Europe trip (nooo! 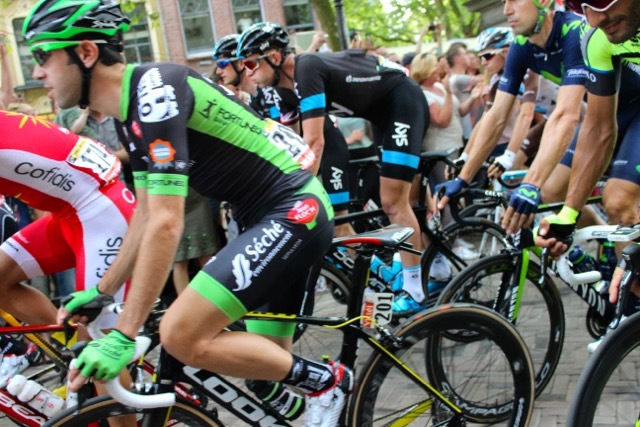 ), so I was so happy to find out that’d I’d be leaving on a high note: specifically, the Grand Depart of the Tour de France in Utrecht. 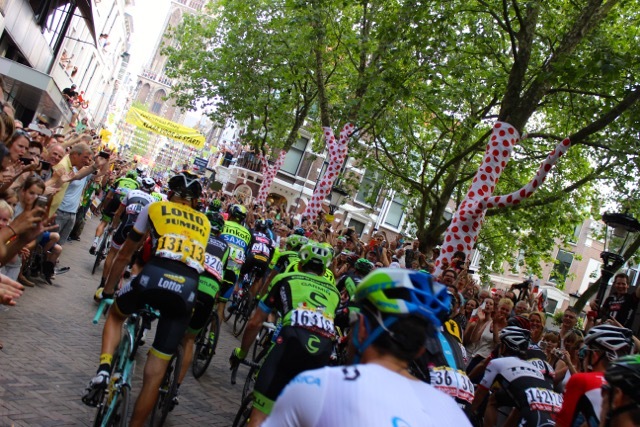 Honestly, I didn’t even know the Tour started in the Netherlands until a few weeks ago, and I was even more pleasantly surprised to learn that the race started in one of my favorite (and very close by) towns– Utrecht. …And even more free stuff. Needless to say, the day was a blast, and I’m looking forward to following the race as the cyclists continue through the Netheralands and beyond. A plus tard and tot ziens! Posted on June 16, 2015 by Sarah S.
Day #2 in Berlin was jammed packed, especially since I chose to cycle instead of take public trans (and inevitably got lost fairly often). The day started early…and rough with one embarrassing crash into the curb (the slow-mo kind that has every pedestrian ogling), one spilled cappuccino, and one lost map. But things got rolling again soon and I cycling my way to every site on my itinerary. The best way to sum up my day is to lay it out meal by meal. After all, I’ll admit that the moments I love most on vacation are the ones where I’m eating! Amazing food, and can you believe I kept it all under 25 Euros!? Looking forward to seeing eating what tomorrow brings. This post is #56 of the #The100DayProject. For more updates on my progress, be sure to follow me on Instagram and look for the hashtage, #100DaysofMiaPrima. Posted on May 6, 2015 by Sarah S.
Yesterday afternoon I arrived in Amsterdam, and to conquer jet lag, my sister and I headed straight from the airport to the tulip fields of Holland. The site of the rainbow fields is like nothing I’ve ever seen (and will ever see anywhere else). We rented bicycles and explored the fields in true Dutch style. Along the way we spotted majestic blue herons, unexpected head winds, charming thatch-roofed homes, and, of course, fields of colors that tilted and blinked like kaleidoscopes as we rode past. The Keukenhof tulip gardens were also an impressive site in their own right. With heavy winds and morning rain, the crowds were thin but the tulips were aplenty. Last year, the tulips peaked in April, so I was grateful to soak up a true prize of Holland in May! This post is #26 of the #The100DayProject. For more updates on my progress, be sure to follow me on Instagram and look for the hashtage, #100DaysofMiaPrima. What a Day to Celebrate the Earth! Posted on April 22, 2014 by Sarah S.
I’ve been celebrating Earth Day with a month of car free Fridays, but today I also made a point of taking my run outside (despite the heavy wind and dipping temps). 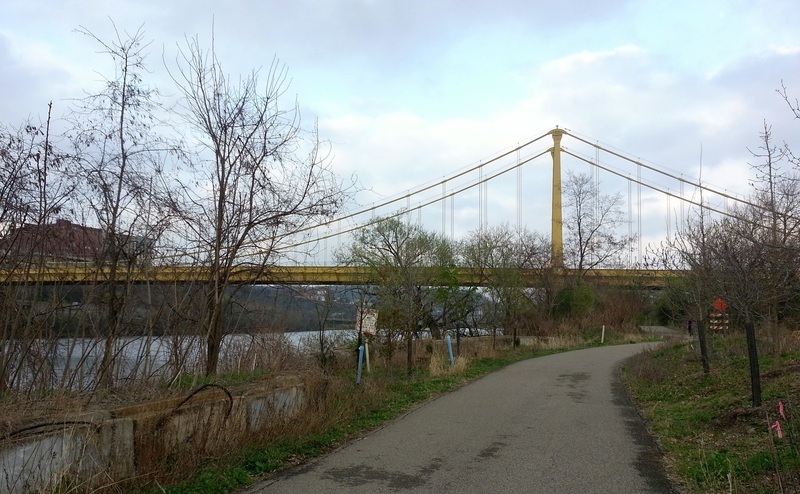 I chose a stretch of the Three Rivers Heritage Trial located on the South Side. I don’t think I’ve ever seen the trails so clean! 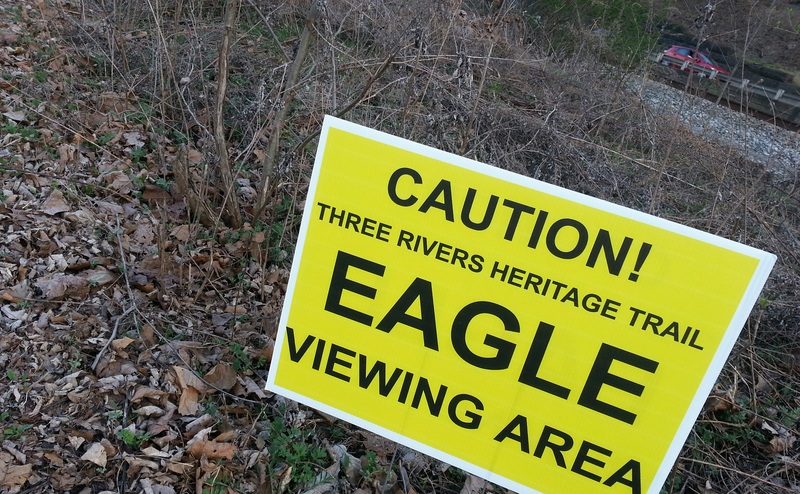 The crowds of volunteers picking up trash and debris from the river front was a happy sight. And there was also that moment when the sun’s setting rays caught the bridges. Sometimes, I can catch that one second when the bridges glow golden with the filtered light. Unfortunately, my camera was too slow. You’ll just have to come to Pittsburgh to see the sight for yourself. How did you celebrate Mother Earth today? Posted on April 2, 2014 by Sarah S.
Last Friday I left work at the usual time, climbed into my car, and then waited through heavy Pittsburgh traffic for the next half hour. A half hour commute sounds pretty decent, right? But not when my apartment is only 2 miles from the office. On a good day, it takes me five minutes to get to work. Friday traffic is particularly awful, and couple that with beautiful spring weather and a desire to get home, open the windows, and let in some fresh air, and sitting in a car moving 4 miles an hour is that much worse. So, I thought about it. I run about a 10 minute mile. That would mean I could run home in about 20 minutes. Not bad! 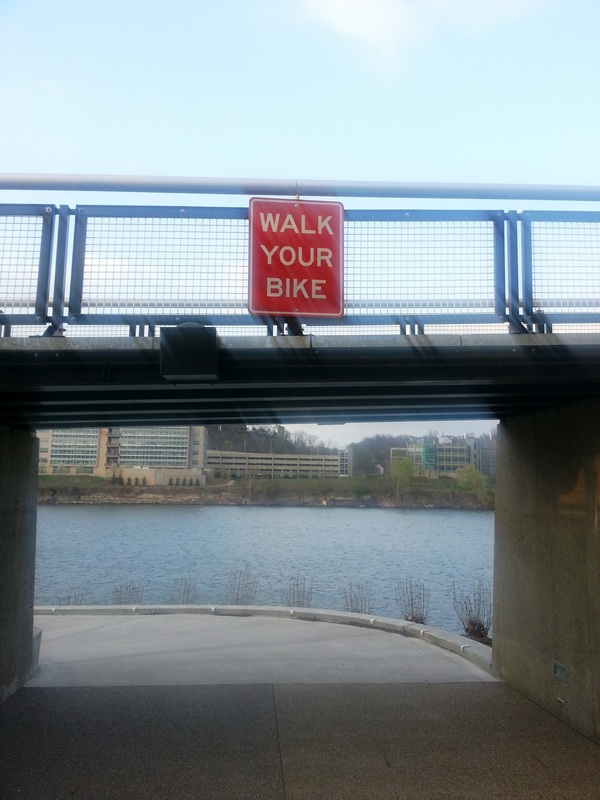 And what about biking? It would surely take me less than 20 minutes. Either way, a car seemed like the least practical option for my Friday commute. 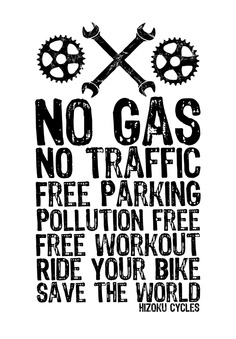 Since it also happens to be the month of Earth Day, and to be totally honest with you, I don’t really ever do enough for the the holiday, I’m going to commit to biking or running to and from work every Friday in April. In total, I will save nearly one week’s worth of gas, gain more than an hour of my time, and spare the Ozone a tiny bit of unneeded exhaust. 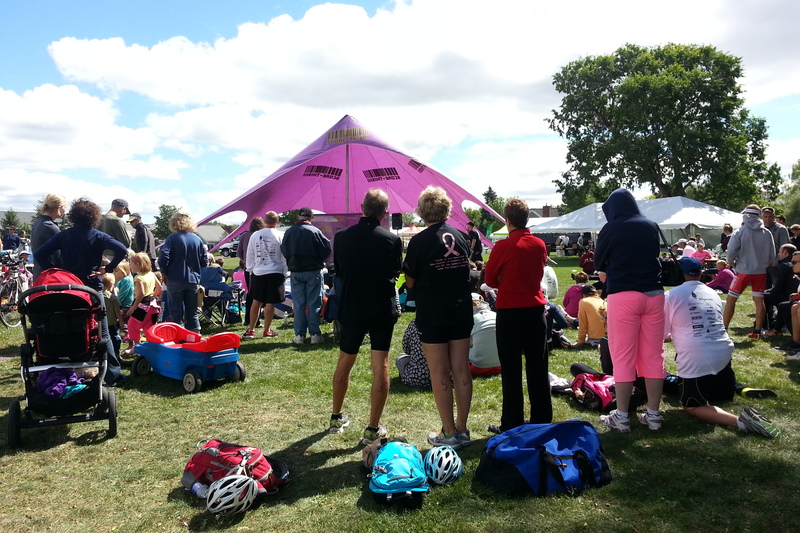 Posted on October 13, 2013 by Sarah S.
About a month ago, I competed in my first triathlon. Generally, I’m pretty relentless when it comes to researching something I’m about to seriously commit time and energy (and sweat and tears) to. When I trained for my first marathon, I read books, talked to experienced athletes, made friends with my local running shop, and otherwise drowned myself in any and all marathon knowledge. 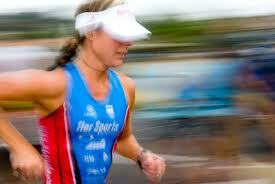 My foray into triathlon was different in only one respect: I researched even harder. My mom is a pretty amazing athlete herself. She competed in her first half marathon this summer (having had very little prior running experience besides her training and coming away injury free- something I can’t boast at 23). Now, she says (and I plan on holding her to it!) she’s up for racing in the Finger Lakes Triathlon with me next year. So this list is for you, Mom! 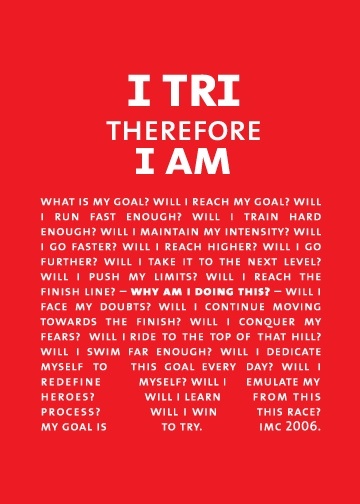 And anyone else who’s bold enough to tri. 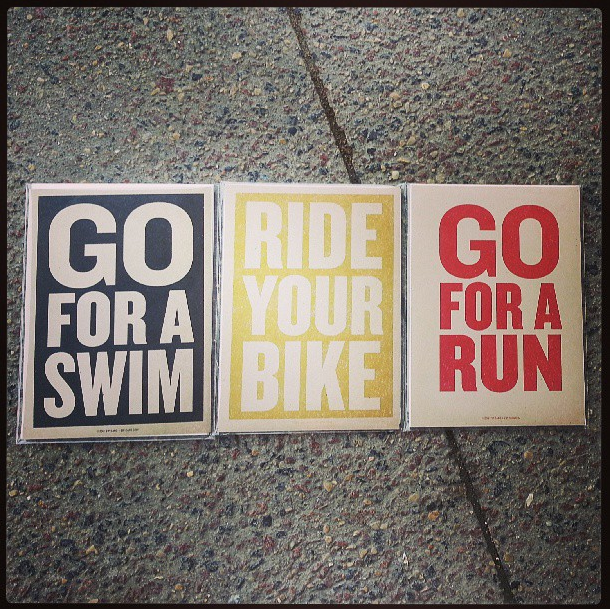 Triathlons aren’t as intense as they seem. Not that you have to tell your friends and admirers that. I don’t mean to say that the race won’t push you to your limits (and beyond, if you let it), but that the triathlon community is actually very encouraging and supportive. There is nothing more relieving than sharing your pre-race jitters with a fellow athlete. And most are willing to relate. I got quick bike maintenance advice from a veteran Ironman and embarrassing wet suit tips (yep, I was the girl who tried putting her wet suit on inside out) from a group of young women triathletes. 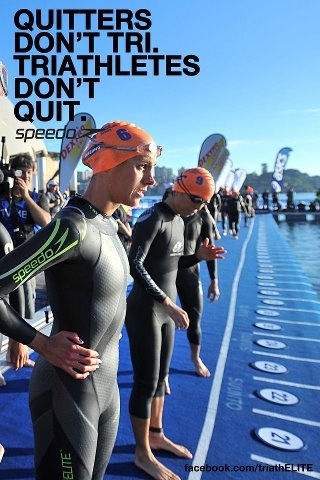 Nobody is there to judge you, and if you make it to the start line, you can be sure that you’ve garnered a whole hell of a lot of respect from everyone of those wet suit-glad athletes around you. From inspirational to super practical, these books were some of my best reads to jump start my training. 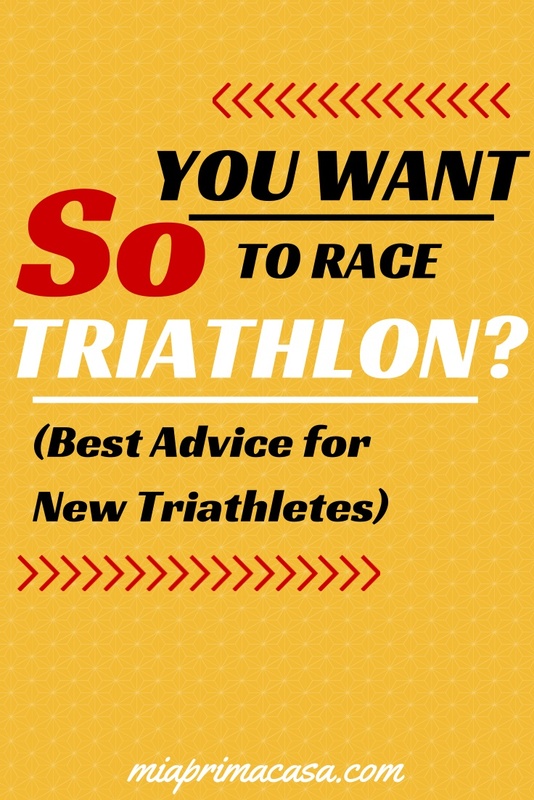 This is a great read for beginners as it breaks down just about everything you would need to know to race your first tri. 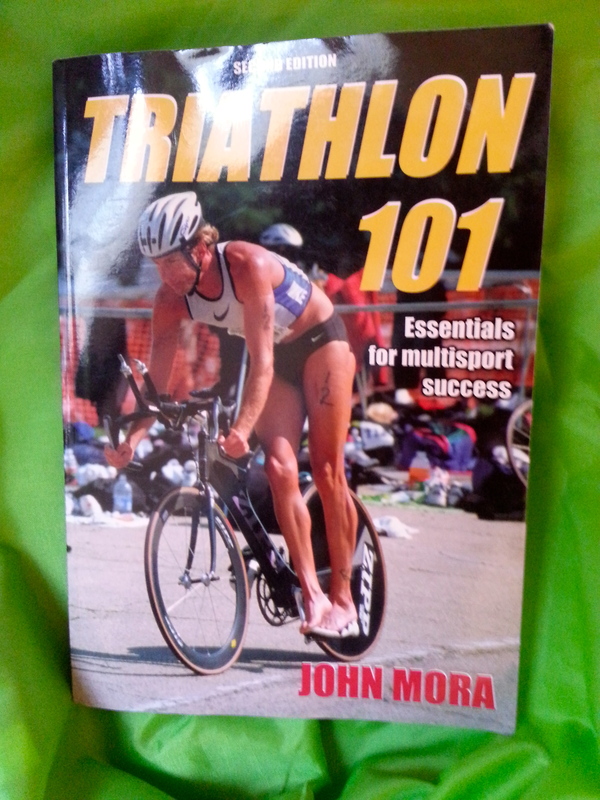 It also has fairly detailed training plans for the most common tri distances, which is why I picked up the book in the first place. I recommend this book to my girl friends who are considering buying their first bike but don’t know where to begin. The author provides a great quiz and lots of details to guide you on the big purchase. 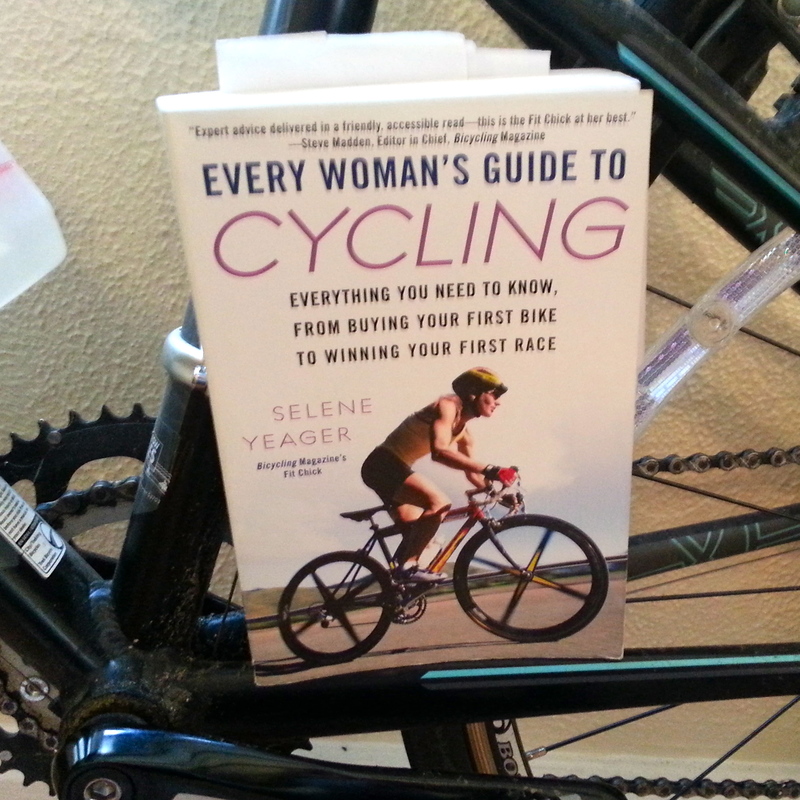 She also gives lots of useful information on cycling in general (particularly with women in mind). I enjoyed reading a women’s-specifc book because, as a petite women, I felt like there might be some logistical things (like finding the right sized bike) that a more general cycling book wouldn’t provide. 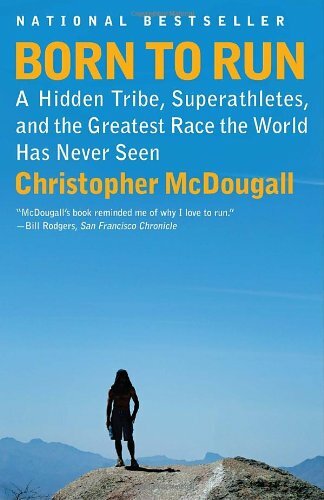 An inspirational true story of a long-hidden tribe of ultra runners and the crazy American ultra champions who decided to race them. I’ve heard this book (rightfully) called the runner’s bible. It’s informational, inspirational, motivational, and reminds runners that as focused as our sport is on the individual, we are all part of amazing community. 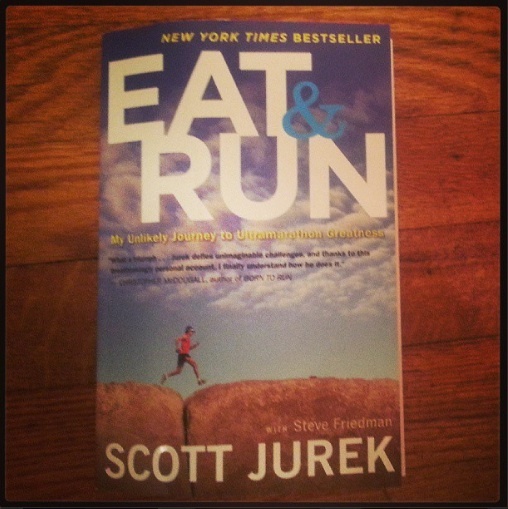 Another inspirational non-fiction read about ultra marathon champion Scott Jurek and his experience with running…and you guessed it, eating. Jurek is a vegan athlete whose dedication to personal as well as physical and athletic health is inspiring. So inspiring that I immediately went on a six mile run after finishing the book. The most difficult leg of the race for me (mentally, anyway), was and still is the swim. 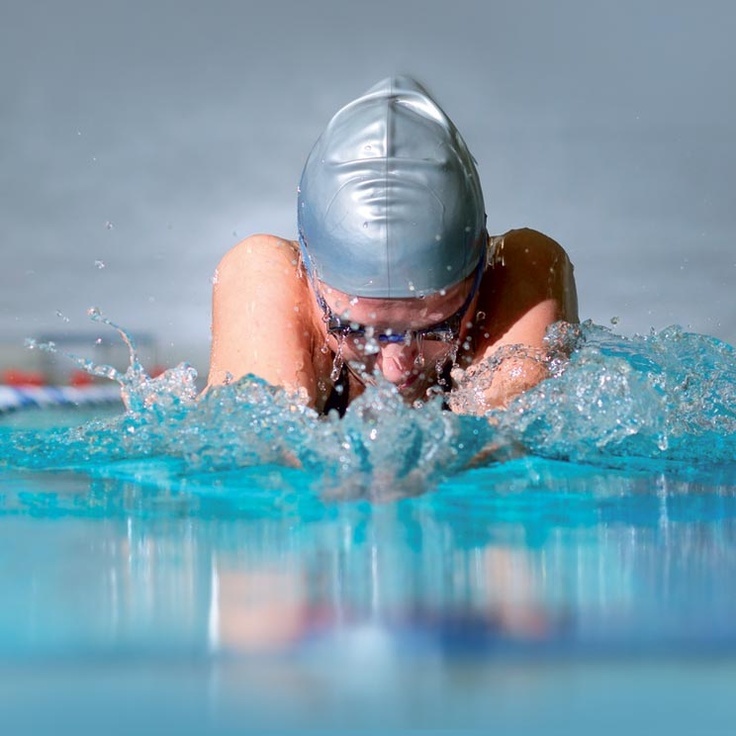 Unlike running and cycling, swimming requires you to focus relentlessly on technique and efficiency. Not that technique doesn’t matter for the other disciplines, but you can’t just expect to put hours and hours in the pool and see speed and endurance results. Swimming takes careful focus on techniques, a large part of which is breathing. I recommend taking lessons if you aren’t a strong swimmer or joining a local swim club. Even having an experienced swimmer friend analyze your stroke is worth it! 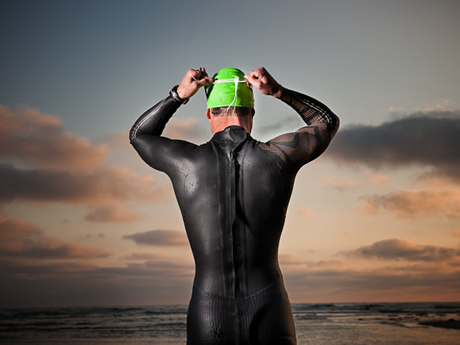 It’s a good idea to practice at least one open water swim before race day. During the course of my research, I read horror stories about the massive difference between pool and open water swimming. It freaked me out considerably, since swimming in a pool was hard enough for me. I managed to squeeze in one open water swim with my wet suit in before the race and one thing I noticed: yes, open water is different, but you can do it because let’s be real, swimming in swimming. You might battle more waves, more people, and no guiding lap line in the water, but take heart that if you stick to your swim training you’re probably going to be just fine. If you can’t manage a practice swim during your training, I suggest trying to get a quick dip in the day before your race at the starting point. It’s a massive relief on the nerves to test out the waters! 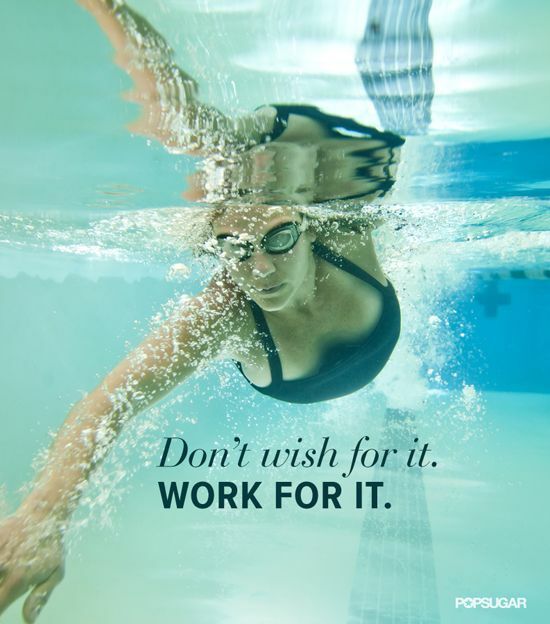 And what about wet suits? My best tip: use one if you can! Wet suits provide more buoyancy in the water, which helps in swimming (obviously). It was also a relief to me to know that if I panicked in the water (which I did by the way), I could simply turn over on my back and float. I chose a sleeveless suit for my first race because I was using a rental and wanted the security of knowing I’d have free range of movement in my arms. For my first race, besides drowning in the swim leg, my second worst nightmare was getting a flat tire. 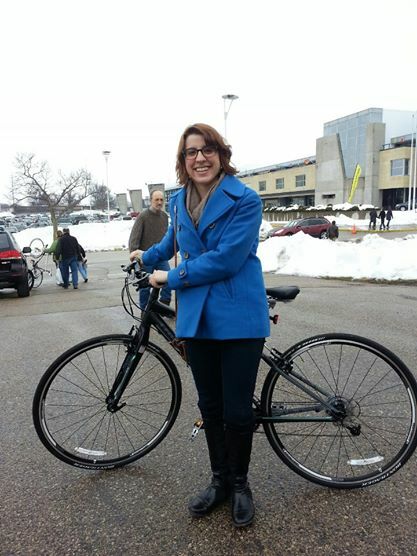 My local bike shop offered a class on changing a flat, during which I could change the tire on my own bike. It was the best research I could do, but I also reviewed some great informative videos to keep myself up to speed. Seriously, you can do it. 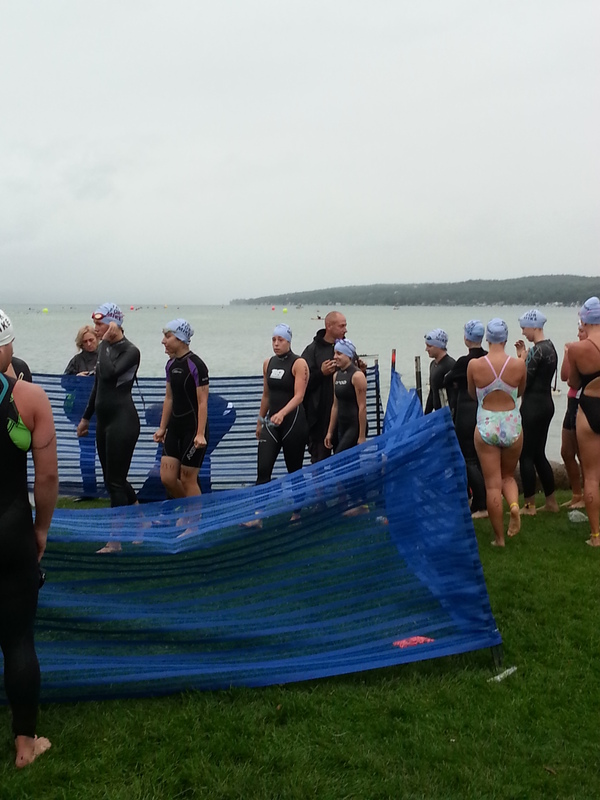 Posted on September 13, 2013 by Sarah S.
On Sunday, September 8th, in Canandaigua, New York, I participated in my first triathlon: the sprint distance Finger Lakes Triathlon, an annual fundraiser for Mary M. Gooley Hemophilia Center. Obviously, I was quite stressed preparing for this race. Certainly because of the swim (before February of 2013, which is when I started my swim lessons, I could barely doggy paddle and couldn’t tread water), but also because this was my first race without my twin sister, Angie. …And also because I was preoccupied with, you know, moving halfway across the country (Madison to Pittsburgh to be exact) as well! During the race (probably a minute after finishing the swim), I realized that my stress was all for nothing. Here I was, finishing the swim leg (my biggest enemy until this point), and running to the first transition. I was doing it, and it felt both awesome and ridiculous (have you ever gotten onto a bicycle soaking wet? )…and not so serious at all! It was actually so fun! The racers were surprisingly chill and open. Like at my first marathon, I felt like I was a part of something bigger- sharing a well-deserved moment with like-minded strangers. Honestly, when I first stepped up to the registration table to collect my bib and timing chip, I felt rushed, intimidated, and nervous. I thought, “I definitely don’t belong here!” Thankfully, a swim clinic hosted by Ironman athlete (she’s swum along side Lance Armstrong! 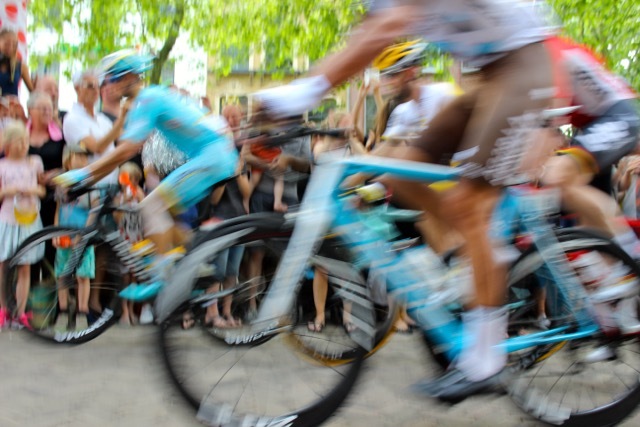 ), Mary Eggers the evening before the race, erased my unease. I was pleasantly surprised by the variety of questions asked by the racers…everything from swim technique questions to how to best put on a swim cap. And each question, no matter how simple or obvious, was answered by Mary with enthusiasm. I realized, nobody was judging anyone here! After all, we were all here at the starting line, weren’t we? It didn’t really matter if this was our first triathlon or our 100th because we were all racing. When Mary led those of us in wetsuits down to the edge of the water for a quick practice swim, I was surprised to find that I couldn’t wait to get into the water! Me, a girl who couldn’t float let alone front crawl eight months ago, was actually excited to swim. I had made it to the start line. It wasn’t quick and it wasn’t easy, but for sure, it is where I belong.